An attractive smoothtop electric range from Bosch touts its genuine European convection oven, which seals in flavor and moisture and evenly crisps the outside of foods. 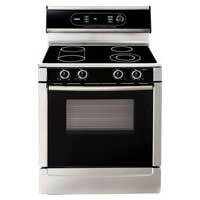 The model has a sleek appearance with black on stainless steel and white outlines of the elements on the cooktop. A particularly useful feature is the warming drawer that’s integrated into the oven design. The ceramic top takes regular wipe-downs to stay gleaming, but the self-cleaning oven is a breeze to keep sparkling. For $1,096, you won’t be disappointed with this Bosch model.